Want to know the difference between CPI and DPI? This post is dedicated to you. It has CPI vs DPI comparison in detail. Whenever you perform a little research before purchasing a new mouse for PC or Laptop, you find the term DPI, Right? It is one of the critical points that users should keep in mind while purchasing a new mouse, especially when you purchasing the mouse for playing games. Now there is something which creates confusion in the mind of people as some companies offer CPI Switch instead of DPI in the mouse. This raises the question in the mind of users that; What is the difference between CPI Switch and DPI Switch? And how it affects the overall mouse using experience. Difference between CPI and DPI – Matter of Thinking? To clear this confusion, I decided to write this post featuring CPI vs DPI comparison so you can understand the difference between both terms. CPI stands for Count Per Inch; the term refers to the total number of the moves mouse outline when it goes one inch. 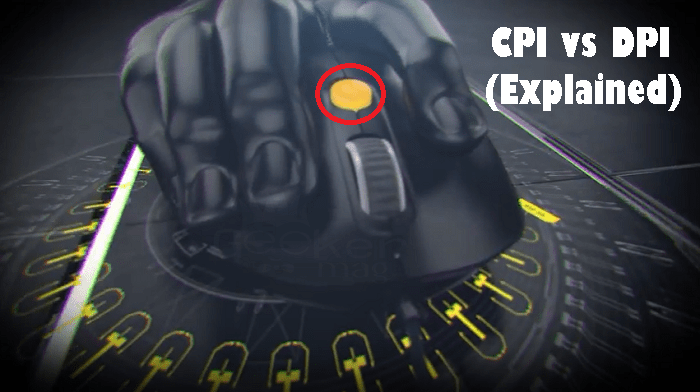 CPI is also named as Sensitivity of the mouse; the same term is used to find out the overall distance covered by the mouse on the screen due to the movement of the mouse on any surface. DPI stands for Dots Per Inch; the term refers to the video dot density or the measure of the spatial printing. It is usually used to explain resolution number of the dot per inch in the digital print. Some refer to it as the printing resolution of the hard copy print dot gain. Mostly CPI term is related to gaming mice, while DPI term is the expression that belongs to printing world. CPI is the normally called as sampling rate per inch, while DPI is the number of the pixel per inch. CPI represents the mouse resolution, while the response from DPI is the static index (mostly used for scanners or printers). When you look at mouse switch, it says DPI rather than CPI, Right? Now, this creates confusion that why DPI is their instead of the CPI. Technically, the right term for the mouse is CPI, but DPI is used because the same term is used widely. For example, if you check work of graphic designers they usually use the term DPI to describe the depth or quality of the image, even they’re relating to the term PPI (Pixels Per Inch). Most of the companies use DPI instead of CPI because the DPI term is popular among general people and they can easily connect and relate to it. Unfortunately, the people proceed to practice in the place of anything that is related similarly to the term DPI. For example, if you check the gaming mice, you will find the DPI switch, but technically it is the CPI switch. While there are mouse manufacturers that are still using the term CPI rather than DPI. So it is cleared that the companies that are mentioning DPI switch in the gaming mouse is using CPI switch, but specifying it a DPI switch because of the popularity of the term. Now you all know that CPI and DPI both are same but technically different. So it is not a matter of thinking, you can use the mouse in the same way you are using it previously. It is also true that mouse manufacturers are aware of the term CPI and DPI, but still, they are keeping utilizing the term DPI because it is common among people. At last, you’re just managing the sensitivity of the mouse no matter what term company is using. I hope you find CPI vs DPI comparison useful and all your confusions related to both of the terms are clear. Stil if you have any question in mind drop it in the comment.